Dontech VCG-Series™ precision glass optical filters optimize display clarity and contrast in demanding applications. Utilizing the latest in glass fabrication and thin-film vacuum deposition technology, Dontech’s VCG-Series™ glass filters provide exceptional optical transparency and environmental durability. Dontech’s precision glass optical filters are incorporated in demanding military, medical, industrial and avionic applications. For high-end display programs, VCG-Series™ filters optimize display clarity and high ambient light contrast (e.g., sunlight readability). Filters can be fabricated from a variety of glass substrates, such as chemically strengthened soda lime (etched or polished), borosilicate, fused silica, and optical glasses (e.g., Schott nBk-7). VCG-Series™ filter customization options include high-energy vacuum deposited coatings such as antireflective, transparent conductive (EMI shielding, transparent heaters), and infrared (IR) or near infrared (NIR) blocking. Additional features include custom screen printing, polarizers, precision machining, and conductive optical grids (woven, etched and printed). Dontech’s glass filters can be laminated or monolithic, clear or colored. Available VCG-Series™ filter sizes range from less than 1” to greater than 42” diagonal, and can be sold as a stand-alone display cover glass product or integrated into a higher level assembly. 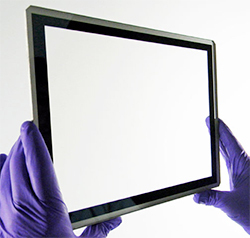 VCG-Series™ filters can be assembled into frames or bezels, or optically bonded to LCDs or touch screens by Dontech using its proprietary IMO-bond™ optical bonding process to improve impact resistance and display contrast.